Breathtaking, fragrant lilac blooms make this traditional rose a winner! An outstanding rose that is almost 100 years old, so has proven a success for many years! Gorgeous fully double lilac pink flowers are simply rammed with petals. Producing huge 10cm (4in) blooms with superb fragrance throughout summer. A real winner. Ht 1.2m x 1m. Supplied as freshly lifted, British grown, professional quality well-branched bushes. 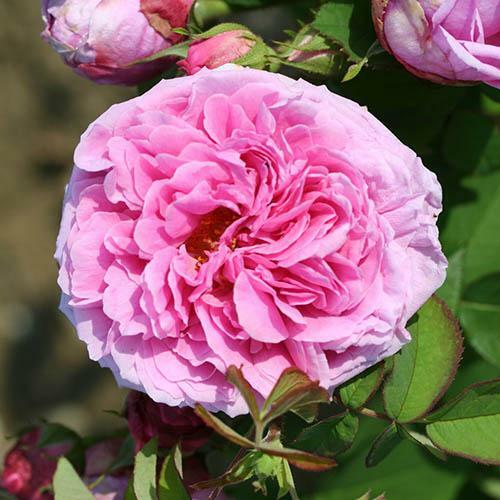 An outstanding rose that is almost 100 years old, so has proven a success for many years, and demonstrates that not all of the best roses need be new breeding! Gorgeous fully double, lilac pink flowers are simply rammed with petals, producing huge 10cm (4in) highly fragrant blooms repeatedly all summer. A real winner. Ht 1.2m x 1m.